Owns a pick-up truck, of which he is the driver. in the tailgate, then groaned. But he fixed it, or he wouldn’t be MacGyver! I would like to point out three things. 1) I was vehemently opposed to MacGyver owning an iPhone because he has a tendency to leave his phones on the truck tailgate or the hood, and drive away. This has happened before, several times, with his non-Smart Phones. (Apparently his Smart Phone is not smart enough to jump into its seat when it’s time to go.) The sole reason for my opposition is that I am then recruited to participate in the roadside search, often in the evening, in the dark, in an attempt to recover the phone or parts of the phone in the road or along the shoulder. From the roadside, we have actually recovered SIM cards, (where important information such as names and phone numbers of business contacts are stored), from his phones that have been smashed beyond recognition, having been crushed by innumerable vehicles. Upon recovery, he has reinserted them in a new phone and they have worked. 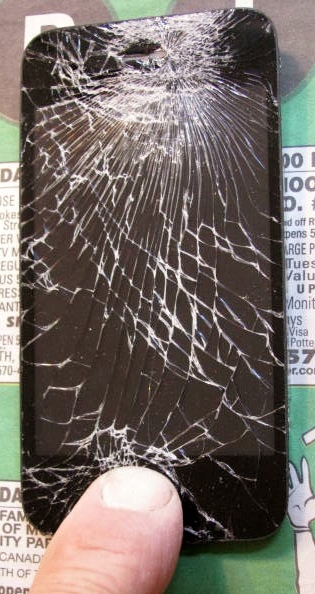 Make a note: If your phone is crushed, your SIM card may still function. Always save your SIM card. 2) When he announced that he was going to fix the phone as opposed to getting a new one, I asked who was actually going to do the fixing, hoping I was not going to be recruited for this job as well. My concern was that his index finger (see photo above) is so large, it could cover three iPhone Home Buttons at one time. Oh ye of little faith (me)! 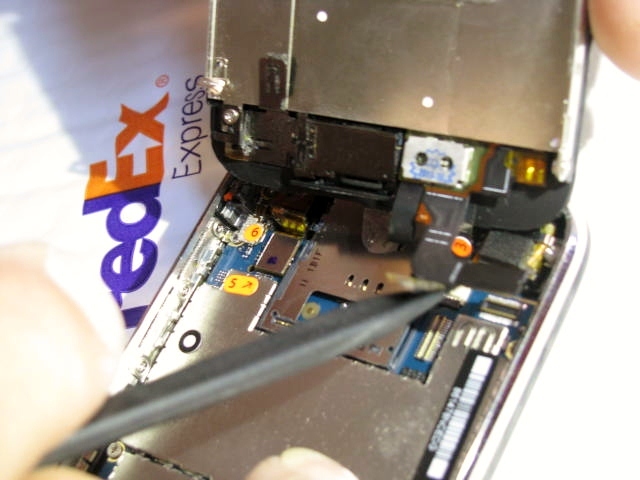 I never thought those big fingers could fix the little, tiny parts on the iPhone. 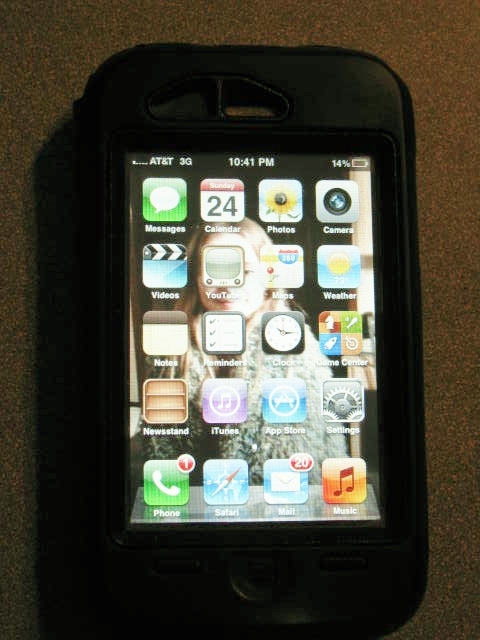 3) The phone was in an Otterbox, one of the toughest iPhone cases available. The case absorbed the brunt of the impact and did survive without any damage. Go Otterbox! First, he removed the broken parts. 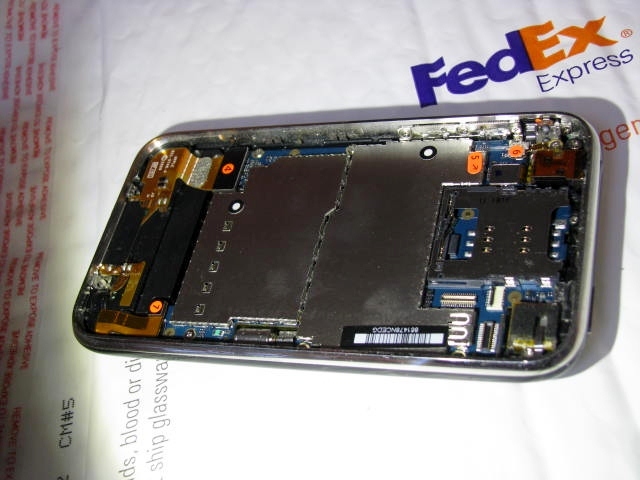 I think the broken parts were the screen and the digitizer. I’m pretty sure I could identify the screen. The digitizer? I’m clueless. He installed the new parts with the handy dandy tools that came with the parts. No big fingers required for any part of this job. And voilà! It’s working again. Fixed his iPhone with a plastic screwdriver. And that’s not a lie. He really can fix anything – MacGyver! Yes, Mr. Fix-It’s are very handy to have around. I’ll pass your message along. Merci! Amen! It sure beat the cost of a replacement phone – iPhone or otherwise. Thanks for stopping by and commenting. Merci! Karen helped him with the roadside search down here, and it was just as you described! He’s very good at it (roadside searching for phone parts, as well as fixing everything) because he was the one who spotted the phone remains on her side of the road. It must be all of that practice! A think all homes should have their own … MacGyver *smile – good on him. Yes, I agree. I think we’ll keep him! Merci!